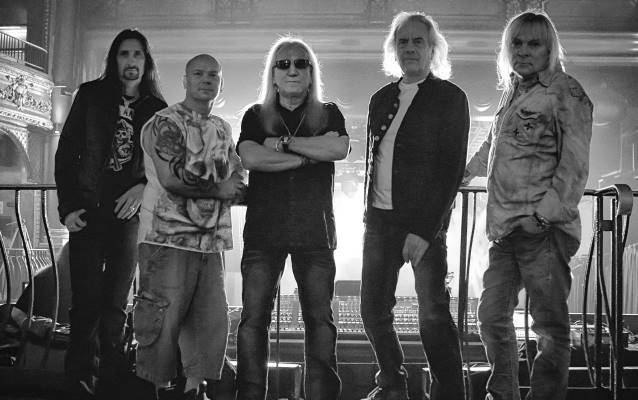 Progressive rock legends URIAH HEEP will release their new album, "Outsider", in June via Frontiers Records. URIAH HEEP's one-off show at Koko, in Camden, London, England on March 4 wwas filmed and released as a live DVD on Frontiers Records in later 2014/early 2015. As well as a host of HEEP classics, the set also included some new songs that will appear on the upcoming CD, following 2011's "Into the Wild", which was the band's highest-charting album since the 1970s in worldwide territories. Fans attending the show also got a chance of being filmed themselves, not only as part of the audience, but also for some special bonus features to be included on the DVD. 2014 is set to be yet another big one for Mick Box and the band as they prepare to release the new material, and, of course, keep on touring; HEEP has been round the world several times in the last 24 months visiting South Africa, Australia, Asia, North America, South America and East and West Russia. The band headlined the first-ever Planet Rock Stock in December. HEEP will play the prestigious Sweden Rock Festival in the summer. The Koko show followed a set of intimate U.K. February dates.